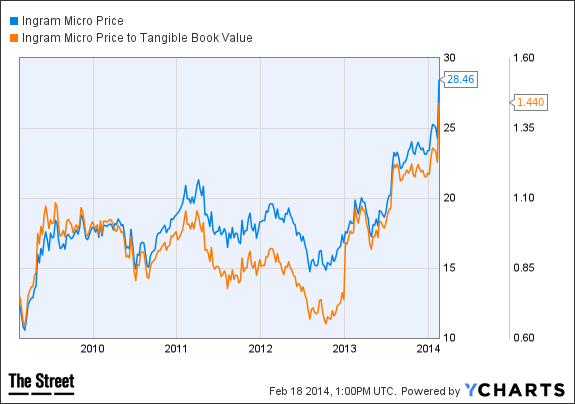 Despite the stock's run-up, it is still compelling from a value perspective. NEW YORK (TheStreet) -- It was deja vu all over again with Ingram Micro's (IM fourth-quarter earnings report, which hit the wires after the markets closed on Thursday. Similar to the final quarter a year earlier, the company beat expectations. Shares rose almost 10% on six times average volume on Friday and now trade at a 15-year high. Fourth-quarter revenue at Ingram -- the world's largest wholesale distributor of information-technology products -- rose 4% to $11.83 billion, just above the $11.53 billion estimate of analysts. Earnings of 88 cents per share were well ahead of the 78 cent estimate of analysts, a nice surprise from Ingram, which is a high-revenue but low profit margin business. The company's acquisition of mobile-services provider Brightpoint for $650 million in 2012 has been paying dividends. According to Ingram, the deal added 35 cents to earnings last year, a penny higher than what was originally expected. Ingram has been a staple on some of my deep value-related stock screens for several years, frequently trading below its net current asset value (net/net). It was also one of the biggest net/nets in terms of market cap that I'd discovered in the umpteen years that I've researched and written on that topic. It has also been a great lesson in the patience required for deep-value investment success; the stock traded sideways during the first couple of years that I owned it, before breaking out last year. Despite its run-up, Ingram's stock is still cheap on several measures. Shares trade at about 1.78 times the company's net current asset value, which keeps Ingram in my "double-net" category -- a self-made term for companies trading between 1 and 2 times net current asset value. Furthermore, it trades at less than 1.5 times tangible book value per share. The balance sheet continues to improve, following the Brightpoint acquisition, which consumed about half of Ingram's cash and added debt when the deal was consummated. Ingram ended the fourth quarter with $674 million, or about $4.25 per share, in cash, up from $595 million ($3.96 per share) a year earlier. Total debt is down to $846 million from $1.05 billion a year earlier. Free cash flow was also solid for 2013, as Ingram generated $370 million, or about $2.34 per share. Shares are trading at 14 times trailing earnings, and analyst estimates are calling for earnings per share of $3.01 for 2015, putting the forward price-to-earnings ratio at about 9.5. Given the low-margin nature of its business, Ingram may never command a high P/E ratio, but a single-digit forward P/E is compelling. At the time of publication, Heller was long Ingram Micro. This article represents the opinion of a contributor and not necessarily that of TheStreet or its editorial staff. Jonathan Heller, CFA,CFP® is president of KEJ Financial Advisors, his fee-only financial planning company. Jon spent 17 years at Bloomberg Financial Markets in various roles, from 1989 until 2005. He ran Bloomberg's Equity Fundamental Research Department from 1994 until 1998, when he assumed responsibility for Bloomberg's Equity Data Research Department. In 2001, he joined Bloomberg's Publishing group as senior markets editor and writer for Bloomberg Personal Finance Magazine, and an associate editor and contributor for Bloomberg Markets Magazine. In 2005, he joined SEI Investments as director of investment communications within SEI's Investment Management Unit. Jon is also the founder of the Cheap Stocks Web site, a site dedicated to deep-value investing. He has an undergraduate degree from Grove City College and an MBA from Rider University, where he has also served on the adjunct faculty; he is also a CFA charter holder.